*Recommended Loader Capacity with Water Kit installed is 1800 pounds. Easily compare Angle Brooms (VAB) and Pick-Up Brooms (PUB). Below are various questions Virnig Manufacturing receives on a regular basis. Browse through the following questions and click on a question to see the answer. If you do not see your question listed below please contact a local Virnig dealer or call 800.648.2408. 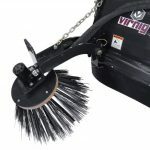 ARE VIRNIG BROOMS DIRECT DRIVE? WHAT ARE THE BENEFITS OF DIRECT DRIVE MOTOR SYSTEMS? Yes, Virnig Brooms use direct drive motors. Direct drive systems have less replaceable wear parts and are more powerful than other drive systems. They are safer than mechanical systems because there are no belt or chain pinch points and no stored energy if hydraulic pressure is properly relieved. HOW EASILY CAN THE BRISTLES BE REPLACED? 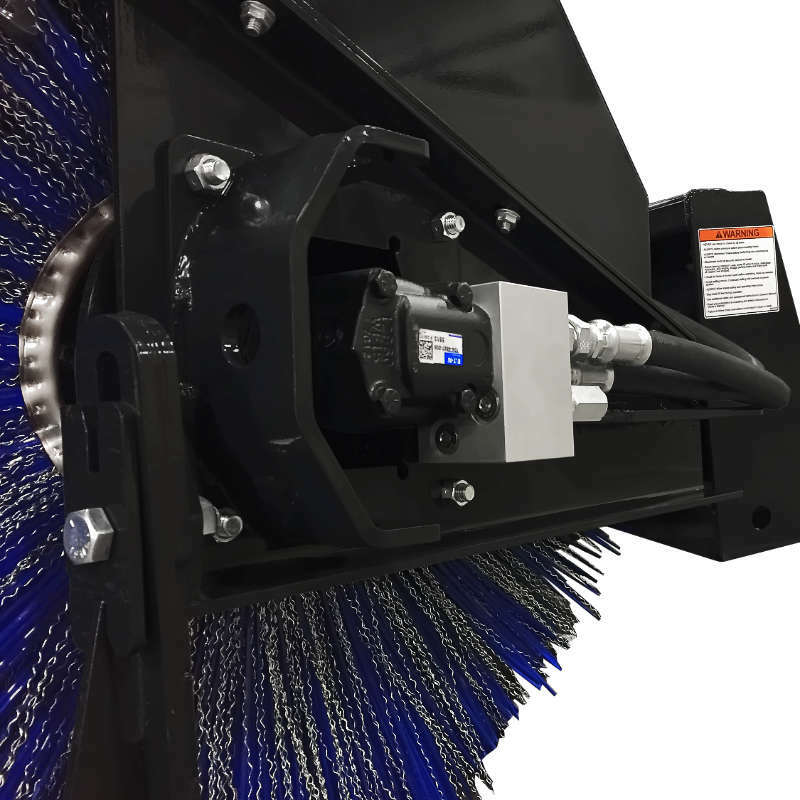 Bristles can be replaced quickly and easily without disconnecting the hydraulics. To remove the bristle core, simply unbolt and remove the hydraulic motor assembly, then unbolt and remove the shaft assembly and bearing to free the bristle core from the brush head. See the product manual for step-by-step instructions. CAN I USE THIS BROOM WITH HIGH FLOW? Virnig Brooms are designed with a flow tolerance of 15-25 GPM. All hydraulic motors used by Virnig Manufacturing are rated with zero overflow tolerance. Operating at a higher flow rate can lead to premature failure and will void the motor warranty. 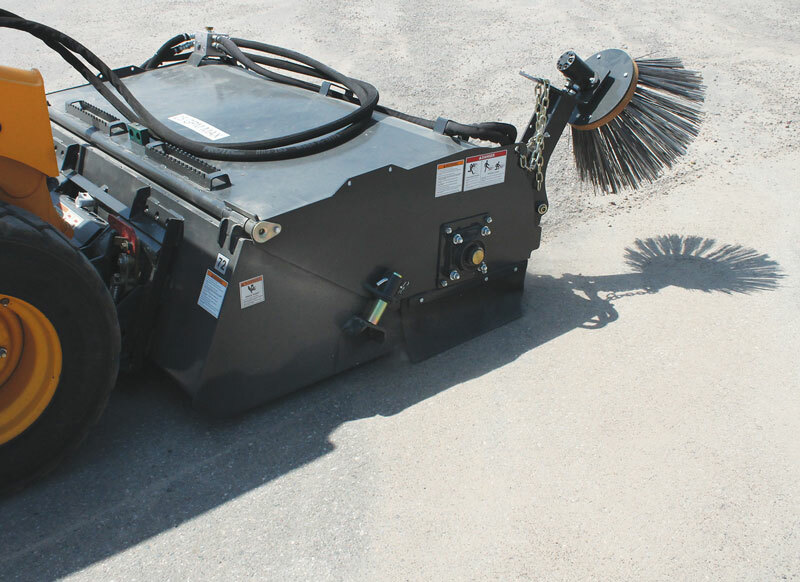 HOW IS THE BROOM’S HYDRAULIC MOTOR GUARDED? The motor is protected on the top, front, and bottom with a ¼ inch plate welded to the motor can. The guarded design allows motor component protection as well as easy access for maintenance. Additionally, the motor on the broom is inset about 4”, which makes it less likely to get hit by obstacles or obstructions while sweeping. WHAT PROTECTS THE HYDRAULIC SYSTEM FROM PRESSURE SPIKES? Standard pressure relief valves protect the motor and the loader’s hydraulic system from damaging pressure spikes. When the maximum pressure point is reached, the valve opens to prevent pressure from rising any further. This prevents seals or other internal components from breaking due to excessive pressure. WHAT WIDTH SHOULD I PURCHASE? 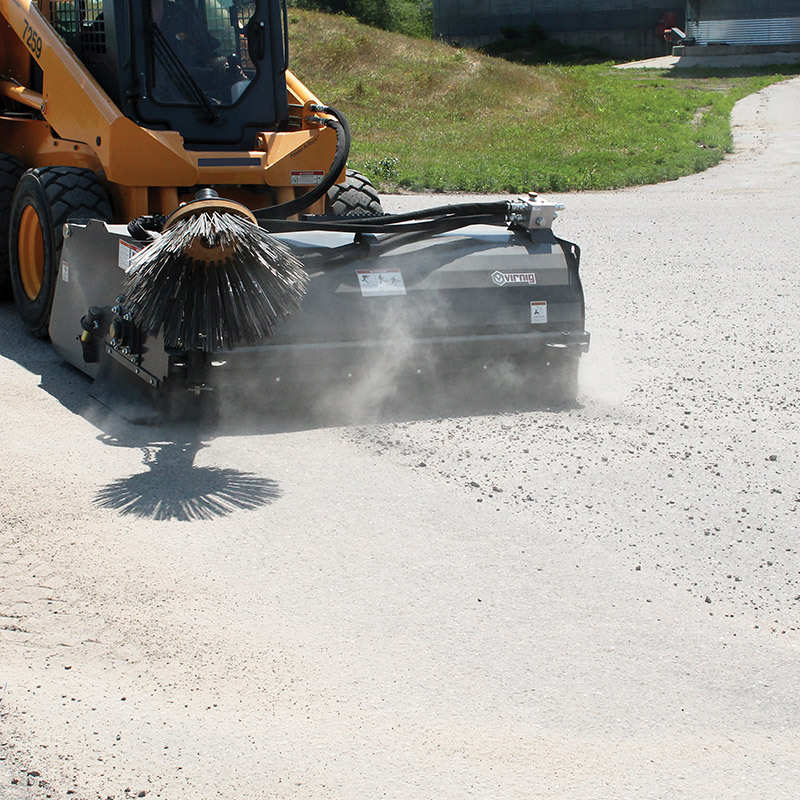 For efficient operation, purchase a broom with a sweeping width that is wider than the tires or tracks of your loader. Loader capacity should also be considered. Selecting a skid steer attachment that is too wide will add weight, volume, and surface area, all factors that could affect performance. WHAT IS THE BENEFIT OF THE GUTTER BRUSH? 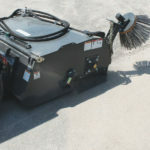 The Gutter Brush is intended for sweeping out gutters and other hard to reach areas that the Pick-Up Broom cannot get into due to frame limitations. 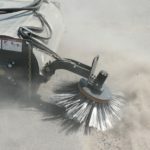 WHAT BRISTLE OPTIONS ARE AVAILABLE FOR THE PICK-UP BROOM? Convoluted alternating poly and wire wafers, all wire, and all poly are available. 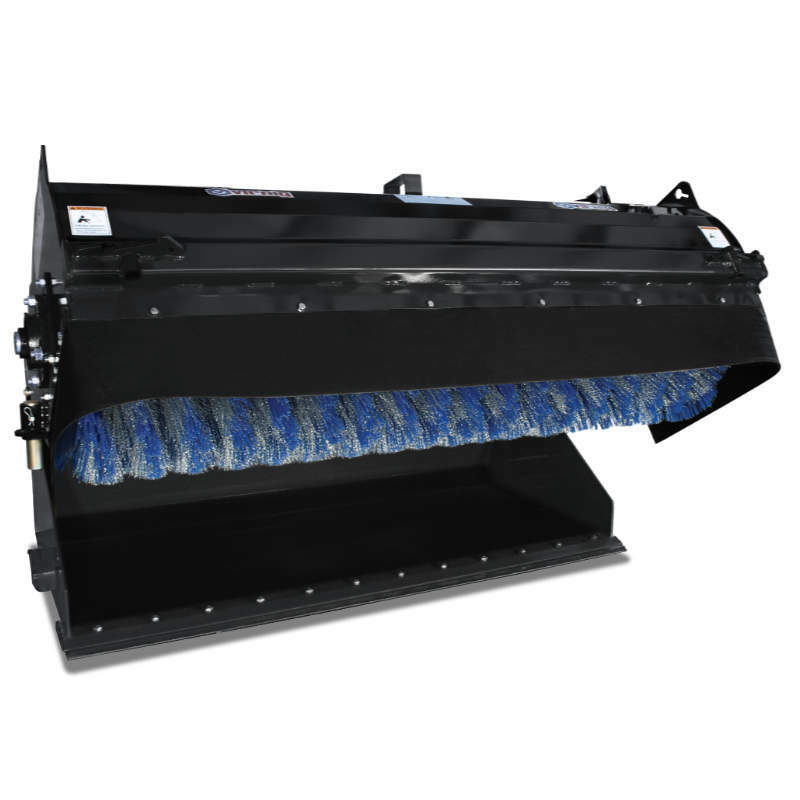 Pick-Up Brooms are equipped standard with the alternating poly and wire package. Virnig Pick-Up Broom wafers have an outside diameter of 26” and and inside diameter of 8.5”. IS THE PICK-UP BROOM BI-DIRECTIONAL? Yes, the dual-directional motor can sweep in both directions. However, in normal operation the broom should pick up material and pull it over the bristles into the bucket. This rotation would be clockwise as the user looks at the motor. WHICH BRISTLE OPTION SHOULD I GET? 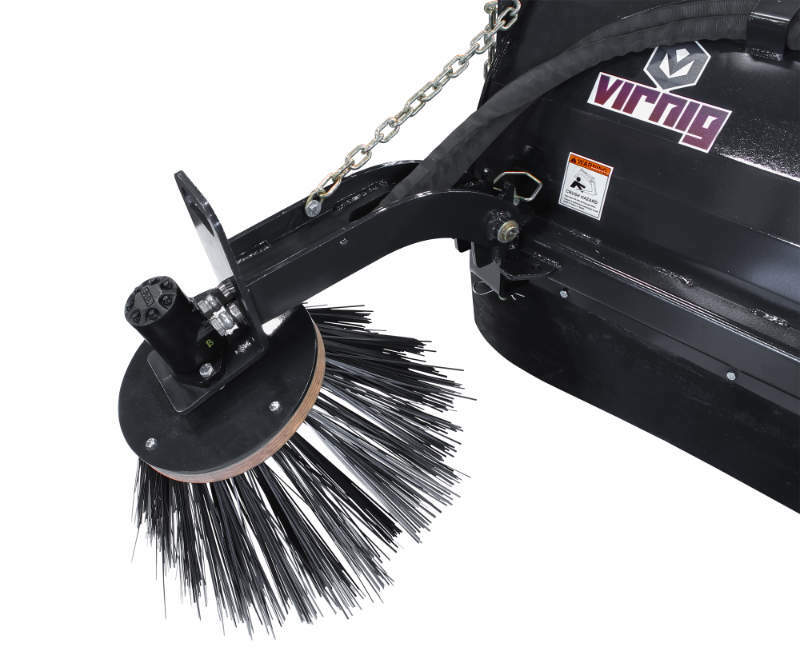 Virnig Pick-Up Broom’s are equipped standard with alternating poly and wire wafers, and are the best all-around option for most jobs. Wire bristles are used to “cut” material, and poly bristles are used to “flick” loose material. Some jobs may not require the use of wire bristles, and having all poly wafers will give more sweeping power. In these cases, all poly wafers would be a better choice. WHY DOES VIRNIG USE A MACHINED PIN ADJUSTMENT SYSTEM? 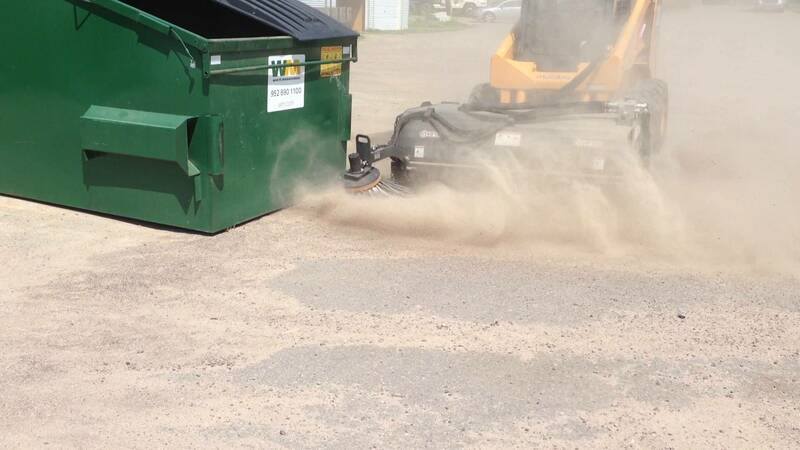 A major cause of wear on skid steer bucket style brooms is improper broom head adjustment. Many other systems utilize a bolt and nut adjustment. These systems can freeze in place when exposed to the elements and can be difficult to adjust evenly. The Virnig adjustment system allows the operator to set bristle height with minimal downtime. Simply elevate the head of the broom from the bucket, remove the holding pin, and set the adjustment shaft. WHAT IS THE BENEFIT OF THE WATER KIT? The Water Kit is designed to spray in front of the Pick-Up Broom. 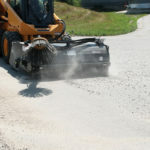 This helps decrease the amount of dust and other airborne debris. The Water Kit is equipped with a 30 gallon tank which can provide 20 minutes of continuous operation. HOW DO I PURCHASE VIRNIG SKID STEER ATTACHMENTS? 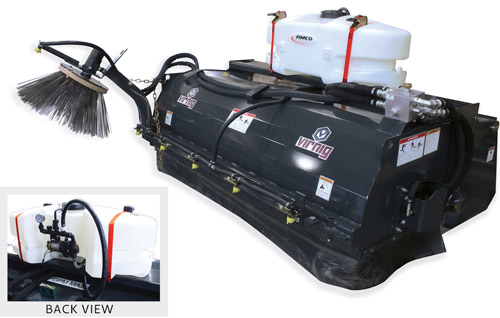 Virnig sells skid steer attachments through a network of independently owned dealers. Call 800-648-2408 for assistance in finding a dealer or use the online Dealer Finder. Please contact a local Virnig dealer to obtain pricing information. For Virnig’s suggested retail price, fill out an online Request a Quote form. WHAT TYPE OF ATTACHMENT INTERFACE/HOOKUP DOES VIRNIG USE? Virnig skid steer attachments are manufactured with a universal mount to fit most skid steer loaders. Mounting frame is built to ISO 24410 and SAE J2513 standards. DOES VIRNIG BUILD MINI-SKID STEER ATTACHMENTS? All attachments have a universal skid steer mount. Use the recommended loader capacity listed per attachment to determine if it is properly sized for the machine in question. WHAT IS RECOMMENDED LOADER CAPACITY? 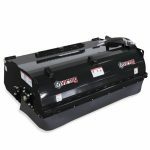 Virnig skid steer attachments are rated to provide maximum performance and protection from damage when used with an appropriately sized skid loader. Go here to find skid steer capacity and specs for 2015 models. Contact a local Virnig dealer for the most accurate specs, or contact Virnig at 800.648.2408. WHY DOES VIRNIG USE NITROSTEEL® CYLINDER RODS? Virnig uses NitroSteel® rods because they are a superior performing alternative to chrome plating. The finish offers improved corrosion resistance and better grease retention. Chrome plated cylinder rods can flake or pit and destroy the seals or other internal components; resulting in downtime and expensive repairs. A NitroSteel® rod will perform better and increase the service life of a cylinder, making it the cost-effective choice. WHAT IS THE SETUP TIME FOR A VIRNIG SKID STEER ATTACHMENT? Most Virnig attachments are ready to work right off the pallet. To minimize set up time, Virnig Manufacturing requires the machine brand and model to be listed on each order for attachments with hydraulic components to ensure proper hose length, routing, and coupler sizing. In addition, all hydraulic Virnig Attachments are tested for leaks and proper operation before leaving the factory. There may be specific scenarios in which additional setup time will be required. HOW QUICKLY CAN I GET REPLACEMENT PARTS? Most parts for Virnig skid steer attachments are available in-stock and can be shipped as early as the same day the order is received. Fabricated and back ordered parts are available with a reasonable lead time. Virnig uses several shipping options to provide timely and cost effective delivery to customers. Check with a local Virnig dealer for replacement part availability. WHAT WARRANTY DOES VIRNIG OFFER? Virnig Manufacturing, Inc. products are warranted to be free from defects, in workmanship, for one year from the end user’s date of purchase. The questions and answers in this FAQ are provided for general information purposes only and may not be completely accurate in every circumstance, view full details. This FAQ is subject to change without notice.